Thanks to my cousin Alan Elliott for much of this information! 1. William Elliott born ___ 1800, Ireland., Occupation: Wesleyan Methodist Min?, married (1) Unknown, died CIR 1820, Transit, Other: Died at Sea., married (2) ___ 1822, in Cavan, Ont., Elizabeth Sherin, (daughter of James Sherin and Unknown) died ___ 1840, Other: Resided, Emily Twp., Ont., married (3) Charlotte McNeely. William died Sep 22 1842, Canada., Other: Resided, Emily Twp./Cavan Twp. Ont. 2. i John J. Elliott born Mar 03 1823.
iii Elizabeth Elliott married William Seaton. Elizabeth died Sep 1918. 4. iv William Elliott born Mar 10 1831.
v Samuel Elliott died ___ 1903.
vi Jane Elliott married Robert Dean. vii Benjamin Elliott born ___ 1842, Occupation: Plumbing Contractor, married Grace ???. Benjamin died Seattle, Wa. 2. John J. Elliott (1.William1) born Mar 03 1823, married ___ 1845, Mary Garnett, born Aug 23 1819, died Sep 14 1888, Buried: Resided, Shield Cem., Omemee, Ont. John died Feb 15 1901, Buried: Shield Cem., Omemee, Ont. 5. i Elizabeth Ann Elliott born Oct 31 1846. 6. ii Garnett Elliott born Jul 10 1848. 7. iii John Franklin Elliott born Aug 29 1851.
iv Frederick William Elliott born Sep 05 1858, died Feb 07 1932. 8. v John Wesley Elliott born Aug 18 1862.
vi Eva Elliott born ___ 1866, died Nov 11 1946, Other: Adopted, Unm. 3. Ann Elliott (1.William1) married Stuart Dean. Ann died 1917, Omemee, Ont. 4. William Elliott (1.William1) born Mar 10 1831, Cavan Twp. Durham Co. Ont, Occupation: Harness Maker, married ___ 1862, in Omemee, Ont., Frances Anne English, born ___ 1843, Omemee, Ont., (daughter of Andrew English and Margaret (Mary) Lang) died ___ 1921, Omemee, Ont., Other: Resided, Omemee, Ont. William died May 19 1918, Omemee, Ont., Other: Resided, Omemee, Ont. i Am Elliott Other: Died at 22yrs. 10. ii Walter Uriah Herman Elliott born Feb 19 1863.
iii Albert Elliott born Omemee, Ont., Other: Died in infancy, Omemee, Ont. iv Caroline Elliott Other: Died at 20. 11. v James Benjamin Wallace Elliott born Jun 24 1866. 12. vi Florence Margaret Elliott born Aug 06 1872. 13. vii Gertrude Elliott born Feb 12 1875.
viii Blanche Elizabeth Frances Elliott born Mar 03 1885, Omemee, Ont., Occupation: Milliner and Postal Clerk, married Alfred M. Young, Buried: Emily Cem.,Con 4,Lot 12,Emily Twp, Ont., Other: Footstone Only. Blanche died Jul 27 1966, Lindsay, Ontario, Buried: Emily Cem.,Con 4,Lot 12,Emily Twp, Ont. 5. Elizabeth Ann Elliott (2.John2, 1.William1) born Oct 31 1846, married Henry William Seaton. Elizabeth died ___ 1904.
i William Seaton Other: Died Young, (Drowned). 14. ii Jason Henry Seaton. 6. 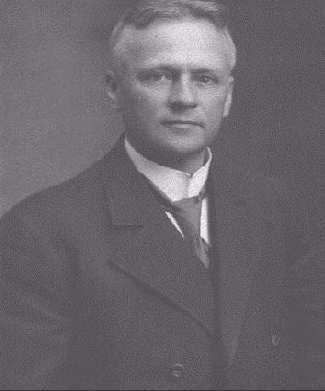 Garnett Elliott (2.John2, 1.William1) born Jul 10 1848, married Florence Putnam. Garnett died Jun 08 1914. 15. i Card Garnett Elliott. Note: I am looking for more information on the North Dakota Elliott's which started with John Franklyn Elliott below. Please email me with any new info! 7. John Franklin Elliott (2.John2, 1.William1) born Aug 29 1851, Occupation: Farmer., married Apr 07 1874, in Mount Pleasant, Ont., Mary Ellen Gardiner, born Jan 15 1850, Cavan Twp., Ont., died Mar 23 1938, Buried: Drayton, N.D. Cemetery. John died Feb 07 1932, Buried: Drayton, N.D. Cemetery., Other: Resided, Dakota Territory 1881 (Pembina Co.). i Emma Theresa Elliott born May 05 1876, Mt. Pleasant, Ont., died Jan 03 1903, Other: Died of TB. ii Ira Russel Elliott born Jun 06 1878, Mt. Pleasant, Ont., married (1) ___ 1903, divorced, Laura Willis, married (2) in Great Falls, Montana., Bertie. Ira died May 16 1958. 16. iii Garnett Harrison Elliott born Dec 04 1879. 17. iv Mary Elsabeth POLLIE Elliott born Apr 12 1882.
v Dixon Gardiner Elliott born Aug 16 1884, married Jul 13 1908, Etta Mae Walker. Dixon died Apr 30 1973. 18. vi Louis Whitfield Elliott born Apr 05 1886.
vii Frank Bertram Elliott born Nov 01 1888, died Oct 28 1906, Other: Died of TB. viii Flora Caroline Elliott born Sep 10 1891, died Jul 05 1908, Other: Died of TB. 8. John Wesley Elliott (2.John2, 1.William1) born Aug 18 1862, married Cora Davidson (or Long). John died Nov 15 1947.
i Morley Robinson Elliott born ___ 1900, married Ivy Wooler. ii Carl Elliott Other: Twin. iii Howard Elliott Other: Twin. 9. Jane Dean (3.Ann2, 1.William1) married Jan 21 1918, Dr. Thompson, born Omemee, Ont., Occupation: Doctor. 10. Walter Uriah Herman Elliott (4.William2, 1.William1) born Feb 19 1863, Omemee, Ont., married Aug 21 1888, in Little Britain, Ont., Mary Elizabeth Blewett, born Oct 26 1866, Little Britain, Ont., (daughter of James Moys Blewett and Mary Deyman) died Nov 25 1949, Toronto, Ont., Other: Resided, Toronto, Ont. Walter died Apr 30 1922, Toronto, Ont., Buried: Mt. Pleasant Cem., Toronto, Ont., Other: Resided, Toronto, Ont. 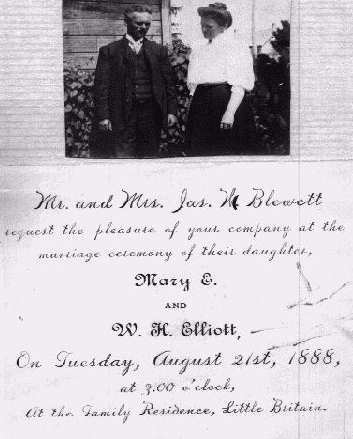 i Bertha Blewett Elliott born Jan 24 1890, died Sep 21 1891, Other: Died in Infancy. 19. ii Wilhelmina Blewett Elliott born Mar 11 1893. 20. iii Herman James Elliott born Apr 18 1895. 21. iv Mary Gertrude Elliott born Sep 27 1899. 11. James Benjamin Wallace Elliott (4.William2, 1.William1) born Jun 24 1866, Omemee, Ont., Occupation: Plumbing Contractor, married Anna Miller. James died ___ 1948, Seattle, Wa. ii Marion Gertrude Elliott Other: Died in Infancy. iv Wallace Elliott born ___ 1904. 12. Florence Margaret Elliott (4.William2, 1.William1) born Aug 06 1872, Omemee, Ont., Occupation: School Teacher, married R. Forbes Stillman, Occupation: Minister. Florence died Jun 23 1946, Toronto, Ont. i Willard E. Stillman married Corrina Dunlop. ii G. Maurine Stillman married Norm Conroy. iv Blanche I. R. Stillman married Ken Christie. 13. Gertrude Elliott (4.William2, 1.William1) born Feb 12 1875, Omemee, Ont., Occupation: School Teacher, married George Pearson Hart, born ___ 1866, died ___ 1958, Buried: Emily Cem.,Con 4,Lot 12,Emily Twp, Ont. Gertrude died Feb 10 1962, London, Ont., Buried: Emily Cem.,Con 4,Lot 12,Emily Twp, Ont. i Frances G. W. Hart born Jun 19 1901, died Dec 20 1903, Buried: Emily Cem.,Con 4,Lot 12,Emily Twp, Ont., Other: Died young. ii Florence G. Hart died ___ 1963, Buried: Emily Cem.,Con 4,Lot 12,Emily Twp, Ont. 22. iii George Elliott Hart born Jun 21 1905. 23. iv William John Hart born Nov 08 1912. 14. Jason Henry Seaton (5.Elizabeth3, 2.John2, 1.William1) married Unknown. 15. Card Garnett Elliott (6.Garnett3, 2.John2, 1.William1) married , Mary. Card died May 06 1958. 16. Garnett Harrison Elliott (7.John3, 2.John2, 1.William1) born Dec 04 1879, Mariposa, near Lindsay, Ont., married Dec 08 1909, Katie Henrietta Craig. Garnett died Apr 16 1958. 24. i Flora Carolina Elliott born Aug 10 1911. 25. ii James Harrison Elliott born Sep 02 1912.
iii Mary Elsabeth ELSIE Elliott born Sep 24 1914. 26. iv Frederick Craig Elliott born Aug 19 1916.
v Ralph Gardiner Elliott born Dec 08 1917, married LaVerne Gaunt Buchanan, died +. Ralph died +. 17. Mary Elsabeth POLLIE Elliott (7.John3, 2.John2, 1.William1) born Apr 12 1882, Drayton, N.D., married Dec 28 1904, Dougald McFadyen. Mary died Jan 26 1972. 27. i Dorothy Myrtle Bailey McFadyen born May 13 1920. 18. Louis Whitfield Elliott (7.John3, 2.John2, 1.William1) born Apr 05 1886, married Oct 11 1911, Gertrude Katherine Ferguson. Louis died Aug 22 1971, Other: Resided, Sask. after 1913.
i Harriet Louise Elliott born Jul 04 1912, married Allan Jardine. Harriet died Nov 26 1957. 28. ii Franklin Julian Elliott born Jun 01 1914.
iii Kathryn Gertrude Elliott born Feb 25 1916, married Nov 06 1936, Elijah LIGE J. McCullough, died Oct 08 1972.
iv Hubert Duncan Elliott born Aug 22 1917, died Sep 1928.
v Sheldon Lewis Elliott born Dec 19 1918, married Nov 04 1944, Gene Stephens. vi Roberta Florence Elliott born Apr 27 1920.
vii Ruth Constance Elliott born Feb 11 1922, married Dec 24 1942, Bertram Gerald Wood. 19. 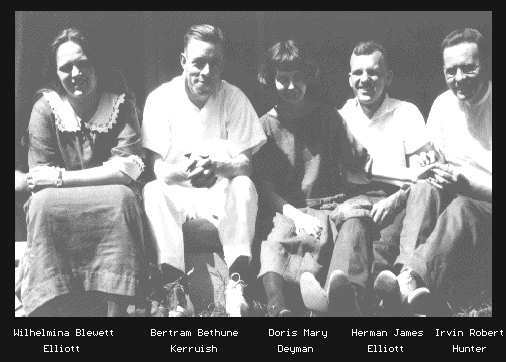 Wilhelmina Blewett Elliott (10.Walter3, 4.William2, 1.William1) born Mar 11 1893, Toronto, Ont., Occupation: Commercial Artist, married Sep 17 1923, in Trinity Methodist Church, Irvin R. Hunter, born Sep 25 1887, Toronto, Ont., (son of William Henry Hunter and Martha Ann Terry) Occupation: Building Contractor, died Feb 13 1929, Toronto, Ont., Buried: Feb 15 1929, Mt. Pleasant Cem., Toronto, Ont., Other: Resided, Toronto, Ont. Wilhelmina died Mar 12 1982, Brockville, Ontario, Other: Resided, Toronto/Brockville, Ont. 29. i William Elliott Hunter born Aug 05 1924. 20. Herman James Elliott (10.Walter3, 4.William2, 1.William1) born Apr 18 1895, Occupation: Civil Engineer, Teacher, married Doris Leone Deyman, died Feb 01 1982, Toronto, Ont. Herman died Aug 03 1992, Toronto, Ont. i Walter James Elliott born Jun 30 1925, Toronto, Ont. 30. ii William JOHN Elliott born Dec 31 1926.
iii Alan Robert Elliott born May 16 1930, Toronto, Ont. 31. iv Nancy Elizabeth Elliott born Dec 01 1932. 21. Mary Gertrude Elliott (10.Walter3, 4.William2, 1.William1) born Sep 27 1899, Occupation: School Teacher, married Hubert Bethune Kerruish, Occupation: School Teacher. Mary died Jan 13 1959. 32. i Margaret Elizabeth Kerruish born Aug 13 1926. 33. ii Mona Marion Kerruish born Jul 01 1930. 22. George Elliott Hart (13.Gertrude3, 4.William2, 1.William1) born Jun 21 1905, Occupation: Railway op and agent, married Viola Cox. i George Albert Elliott Hart. 23. William John Hart (13.Gertrude3, 4.William2, 1.William1) born Nov 08 1912, Occupation: School Teacher, married Ria Findlay. i Katherine Hart married Rick Irwin, Occupation: Doctor. I have several generations beyond this point.